Policies – Click to see our policies on reservations, cancellations, smoking and pets. All of our units (except the Cottage) are not pet friendly. Smoking is only permitted in a designated area. Planning a business or church retreat, family reunion or group event in Newcastle, WY? 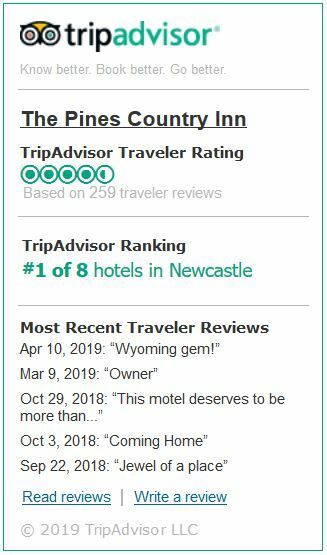 The Pines Country Inn offers clean, comfortable accommodations for up to 37 guests for your function. Pinnacle Bank offers a spacious and private meeting space, free of charge. Call 307-746-4466 for availability. Weston County Library in downtown Newcastle also offers a couple of meeting room options. Reservations are required. Visit the Weston County Library website on meeting rooms for detailed information. Newcastle offers dining and recreation for you and your guests to enjoy while in our area. Please visit the Newcastle Chamber website for more information.